Below are common attributes associated to Sugarberry Ruffles Spanish Lavender-(Lavendula Stoechas 'Sugarberry Ruffles'). 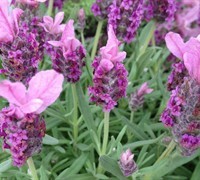 Become a care taker for Sugarberry Ruffles Spanish Lavender-(Lavendula Stoechas 'Sugarberry Ruffles')! Below are member comments regarding how to plant Sugarberry Ruffles Spanish Lavender-(Lavendula Stoechas 'Sugarberry Ruffles'). No comments have been posted regarding how to plant Sugarberry Ruffles Spanish Lavender-(Lavendula Stoechas 'Sugarberry Ruffles'). Be the first! Do you know how to plant Sugarberry Ruffles Spanish Lavender-(Lavendula Stoechas 'Sugarberry Ruffles')? Below are member comments regarding how to prune Sugarberry Ruffles Spanish Lavender-(Lavendula Stoechas 'Sugarberry Ruffles'). No comments have been posted regarding how to prune Sugarberry Ruffles Spanish Lavender-(Lavendula Stoechas 'Sugarberry Ruffles'). Be the first! Do you know how to prune Sugarberry Ruffles Spanish Lavender-(Lavendula Stoechas 'Sugarberry Ruffles')? Below are member comments regarding how to fertilize Sugarberry Ruffles Spanish Lavender-(Lavendula Stoechas 'Sugarberry Ruffles'). No comments have been posted regarding how to fertilize Sugarberry Ruffles Spanish Lavender-(Lavendula Stoechas 'Sugarberry Ruffles'). Be the first! Do you know how to fertlize and water Sugarberry Ruffles Spanish Lavender-(Lavendula Stoechas 'Sugarberry Ruffles')? Below are member comments regarding how to deal with Sugarberry Ruffles Spanish Lavender-(Lavendula Stoechas 'Sugarberry Ruffles')'s pests and problems. No comments have been posted regarding how to deal with Sugarberry Ruffles Spanish Lavender-(Lavendula Stoechas 'Sugarberry Ruffles')'s pests and problems. Be the first! Do you know how to deal with pests and problems with Sugarberry Ruffles Spanish Lavender-(Lavendula Stoechas 'Sugarberry Ruffles')? Looking for Sugarberry Ruffles Spanish Lavender-(Lavendula Stoechas 'Sugarberry Ruffles')? Get Sugarberry Ruffles Spanish Lavender-(Lavendula Stoechas 'Sugarberry Ruffles') fresh and large directly from the grower to your garden! Buy Sugarberry Ruffles Spanish Lavender-(Lavendula Stoechas 'Sugarberry Ruffles') online from the nursery wholesalers and save BIG!